Breakfast & Lunch Mon.-Sat., Dinner nightly, Brunch Sat.-Sun. 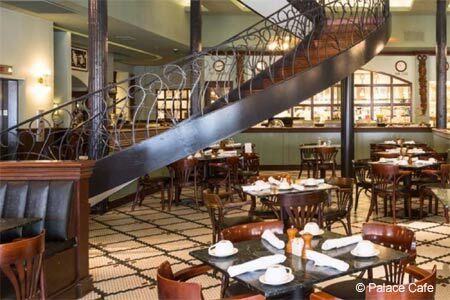 : Historic buildings never die in New Orleans --- instead they often become fine dining restaurants. This one, located in an elegant downtown building that once housed a piano company, is Dickie Brennan's double-level Palace Café. The interior finishes include an eyeful of drugstore-tile floors, burnished-wood banquettes and a central, graceful staircase spiraling toward the second floor, where a spectacular rum bar and lounge has its own kitchen, offering charcuterie and small plates. Try the crabmeat cheesecake, a signature starter. Chef Gus Martin’s house specialties include an andouille-crusted Gulf fish and the shrimp Tchefuncte, a simple preparation of plain ingredients: shrimp, whole button mushrooms, meunière sauce and popcorn rice. But the whole is much greater than a sum of its parts, a typical Creole characteristic. White chocolate bread pudding is now found all over town, but this is the home of the original (as well as the best) version. Sunday brunches are accompanied by a jazz combo. Much like Brennan's other restaurants, Palace Café’s wine list is constantly updated and efficiently populated with everything that needs to be offered. To its credit, the restaurant offers 15 to 20 wines by the glass, and they change regularly.